Every year we get too excited about the potential of some young stars. Who is in this year’s all-hype team? 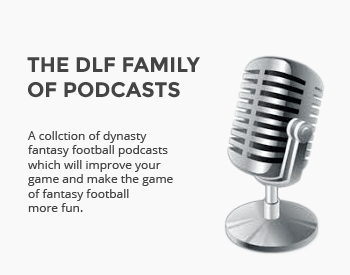 I’ve spoken in the past about the concept of fantasy value versus dynasty value. The former is fairly straightforward – players that score more points have more fantasy value, regardless of any extraneous factor (i.e. age). The latter is essentially “user based,” with the value being determined in a more artificial sense. In other words, if the vast majority of owners rate a player highly, that’s what he’s worth, regardless of what he’s done between the white lines. Now, of course, there are numerous examples of players who possess both types of value. Young studs have the best of both worlds – they’re winning you games right now with their play, while owners simultaneously fantasize about the same thing happening for years to come. Even older “veterans” at the apex of their game, a la Julio Jones and Antonio Brown, remain highly regarded. Once you hit a certain, age-related point, however, there’s nowhere to go but down (Larry Fitzgerald says hi!) and that’s fine, because these players are still scoring you points and doing so at a discount. They may have dwindling dynasty value, but they’re producing where it matters, rendering them as a very useful and cost-effective class of players. But it’s opposite of this scenario that confounds me the most. I’m talking about the guys who’ve done little to nothing on the field, yet are still thought of a lot more highly than their productive counterparts. I’m talking about the Dynasty All-Hype Team. Listed below are players who, according to the most recent January ADP, still carry quite a bit of value in the minds of dynasty owners, regardless of their lack of NFL production. I’ll provide a brief synopsis of each, along with listing some players I’d rather own at the price points. Please note, however, that I won’t be including any rookies in this exercise – I’m well aware how talented freshmen are valued, and it’s no surprise if they don’t produce early on. With that in hand, let’s reveal our overrated all-stars! Awesome article, its nice to sift out and see through all this mislead hype! I disagree with your Moncrief take, but, otherwise, great article! Re: Moncrief, he was injured this year and didn’t have Luck throwing to him for most of 2015. I’m not necessarily saying he’s a better fantasy asset than Landry, but the guy has some serious upside. If his 2017 is like his 2016, I’m with you, but I’m not eager to sell him yet. For starters, Landry has been available, Moncrief, not so much. I’m a sucker for his natural given ability too, but it’s been long enough that this is probably what he is. At this point, until proven otherwise, I agree that Moncrief belongs on this list. I was higher on him a the beginning of the season, but even when he was healthy he only had one game over 60 yards. If Indy adds another red zone threat, he’ll have to pick up his overall game in a big way. It’s just crazy to me that he’s just outside the second round in startups. sweet idea & execution of putting it into words. My All-Hype nomination is Devante Parker. Yeah, he was great in college, but weren’t most all NFL WR’s? What has he done to prove anything, let alone the overall DLF WR19 standing. No way dude. Would rather have Coleman, Shepard, Adams, or Doctson than that cat! Wait wait wait…you are putting Parker on the all-hype squad, but you would rather have Doctson and Coleman?!?! Does the left side of your brain communicate with your right side? And Adams was Parker last off-season and for the first time actually put it together. Shepard is JAG who seems soft coverages due to who he plays with. Still can’t figure out how Coleman and Doctson aren’t over-hyped, but Parker is…literally no words. Johnny…let’s be clear! I don’t own one share of Parker on any of my 6 teams so it isn’t like I am some biased fan. Not sure if you knew this or not, but those numbers you posted for him against Shepard were playing just 8 games vs. Shepard who played every game I think. Sorry, Shepard’s numbers scream JAG to me considering he had the entire middle of the field to operate. I just feel you are all over the place. Let’s move on to Doctson…same draft pedigree as Parker and same injury problems to a degree. So you give Doctson a pass, but not Parker? Are you spending a 4th/5th round startup pick on Doctson? Do I really even need to talk about Coleman? Are you spending a 2nd round startup pick on a guy who caught less than 50% of his targets and may or may not be able to run a full NFL route tree? Sure he made some plays. But so did Parker his rookie year…how are you giving Doctosn and Coleman a pass, but burying Parker? And I don’t own Doctson, Shepard, Coleman, or Parker on any of my teams so I am not playing favorites…seems like you are though, which was my point. Now while I won’t put Parker on the all-hype team by any stretch, I’ll tell you that as a Giants fan, I think you’re misjudging Shepard. While he didn’t light the world on fire, you have to remember that the Giants basically had zero running game and a terrible OL, which they compensated for by running 90% of their plays out of “11” personnel. None of our TEs stepped up to make a dent and Cruz was our tallest receiver at 6′. Also, Eli was basically wearing whichever DE was running unhindered past Erik Flowers. This doesn’t lead to great production. If Jerell Adams (rookie TE this year) takes a step forward as a blocker in year two, (or they draft somebody) the running game is going to take pressure off all the receivers. They also need to pick up a tall WR2. Sadly, I don’t think they’ll pay Alshon, but I do believe they’re getting a big body to replace Cruz, who is looking like a cut. Now onto Shepard. The guy can flat-out run routes and catches mostly everything thrown at him. Once this offense isn’t a complete dumpster fire, I like him as a midrange to high-end WR2. Remember, McAdoo is running the WCO out there. Eli likes to send it his way and once he has some time to throw, I think Shepard is going to find himself the beneficiary of many dump offs, only this time, he’s not going to be surrounded by defenders due to our absolutely pathetic play calling. Don’t forget that Jay Ajai is looking to get the feature back treatment down in Miami next season, which is going to limit him across from Landry. I like Parker as a bargain, not at 29th overall in dynasty. I’d put him ahead of Doctson and Coleman easily, though. While I am not going to anoint Parker “elite” to label him over hyped though is premature as well. I think showing progress and production the first two years on a team competing for catches with Rishard Matthews, Kenny Stills and Jarvis Landry in his rookie year. Followed by he stepped up more so they left Rishard go and I am guessing this next season let Stills go and bring up Carroo. He has down well. If he regresses this season or catches 80 and 1000 will be important. Seems like reasonable arguments for Parker. Like Adams, we’ll see if year 2 was really due to the injuries or not. Just curious, does that mean you’d pay the current DLF ADP price for Parker, i.e. 29th overall? I’ll more side with Aaron here. I don’t know that Parker is a future stud, but he turned in on at the end of his rookie year, and had a pretty solid second season. There’s no way I would pay his cost right now, but I need to see him not produce in Y3 before I include him here. If there’s “no way” you’d pay his cost, isn’t that the definition of over-hyped? Yes and no. I didn’t include anyone with under three years of experience because I understand how the dynasty community tends to hold onto young, potential studs (I myself lean towards veterans at the cost, but firmly understand I’m likely in the minority here). I do believe that you might be buying him at his ceiling right now, but I also believe that he improved enough between Y1 and Y2 that I’m at least interested in his Y3. However, if he drops off like Moncrief or Matthews, I’ll be 100% with you a year from now. I realize that Sammy’s talent is mouthwatering, but if you are going to dock Ladarius so much why not dock Sammy Watkins as well. I would easily take the next 5 guys that follow him in the ranks, and others as well. I don’t agree on Sammy. I think the scene change that comes with the new coaching staff is exactly what was needed for him. Buy him now before everyone else agrees. Have to disagree here. Sammy had nearly 1,000 yards in Y1, and went over 1,000 yards in 13 games in Y2, when he was arguably the most efficient WR in PPR. He did get hurt last year, but otherwise he was on a decidedly ascendent trajectory. No mention of Diggs ? This guy had just a few good games and if he displaus some talent he actually has a 3rd round ADP. This is nuts.